Indoor gardening is a bit different to gardening outdoors. In the garden, there are so many plants that some can get away with not looking brilliant all the time. But if you are using plants indoors, they are often a feature on their own, or with just one or two specimens, and they need to look good all the time. One of the easiest of all house plants to look after is the good old-fashioned sansevieria that we used to call mother in law's tongue and is sometimes called snake plant. It is a type of succulent, and interesting because it has no stems or branches. The stiff leaves emerge from a rhizome that grows beneath the surface. The leaves usually have interesting patterns in shades of green, grey, white and yellow. There are about 70 types of sansevieria, but the most common one indoors is S. trifasciatia. There are lots of different forms, but all have striking stiff, flat leaves that may be 10-80cm tall. Some are in perfect rosettes, others emerge individually from the rhizome. Sansevieria cylindrica also works well indoors and has tall, round leaves with interesting green and grey markings. Another variety that is brilliant for indoors is S. masoniana Mason's Congo. The leaves on this one are flat and very broad, up to 25cm across and more than a metre tall. It's a big plant and looks very elegant in a lovely pot. Although we grow them for their foliage, sansevieria will sometimes produce a spike with many small white or cream flowers. Sansevieria will grow happily in a brightly lit room, and, with the exception of Mason's Congo, can tolerate a bit of direct sun at times. They will tolerate lower light levels and will generally have deeper colour in a darker spot. They are easy to look after - water only when the potting mix is quite dry and don't let them sit in water. Keep them dry. 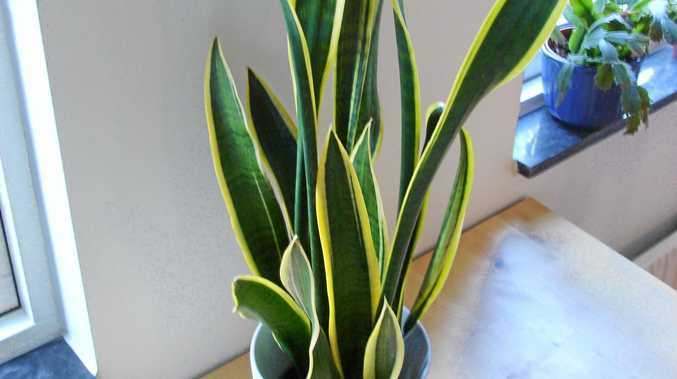 The NASA Clean Air Study says sansevieria can remove toxins including formaldehyde, xylene and toluene from the air. They absorb carbon dioxide at night and release oxygen in daylight, making them very good plants in a bedroom. The leaves may cause skin irritation and are mildly poisonous if eaten. Fortunately, the tough leaves are hard to break or tear, but it would be wise to keep them out of reach of young children. Sansevierias have a reputation because they do have weed potential, especially in a semi-shaded position in sandy soil. They are absolutely fine in a pot in your home, but treat them with caution in a garden. And of course, dispose of unwanted plants responsibly.